In just one week you’ll be feeling better in body and mind. Tegan Haining, personal trainer to the stars, brings you her specially-designed programme that will produce rapid results and set you on your way to a healthier lifestyle. Whether it’s a seven-day blitz before a holiday or special occasion, or a week to get your diet and exercise back on track after Christmas, Tegan’s simple plan is easy to follow from start to finish. Each day she’ll guide you through three healthy meals and a workout or stretching session, and share her top tips for wellbeing from her career as a model and health coach. 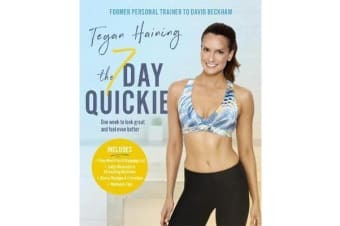 Complete with a shopping list for the week and quick journal activities to help you track your progress, The 7 Day Quickie also comes with vegetarian alternatives, bonus recipes and extra workouts so you can repeat and personalise the programme once the week is over.